Summary: Researchers have identified how the ASPM gene controls the growth of the cerebral cortex. They report mutations in this gene can reduce brain volume by half in human microcephaly cases. The ferret brain is convoluted and contains diverse neural progenitor cell types during development, similar to the human brain. Loss of a gene linked to human microcephaly causes the same severe phenotype in the ferret (right) and provides an insight into cerebral cortical development and evolution. NeuroscienceNews.com image is credited to Yale Magnetic Resonance Research Center. Funding: The research was funded by National Institutes of Health, Howard Hughes Medical Institute, and Allen Discovery Center program. Image Source: NeuroscienceNews.com image is credited to Yale Magnetic Resonance Research Center. Original Research: Abstract for “Aspm knockout ferret reveals an evolutionary mechanism governing cerebral cortical size” by Matthew B. Johnson, Xingshen Sun, Andrew Kodani, Rebeca Borges-Monroy, Kelly M. Girskis, Steven C. Ryu, Peter P. Wang, Komal Patel, Dilenny M. Gonzalez, Yu Mi Woo, Ziying Yan, Bo Liang, Richard S. Smith, Manavi Chatterjee, Daniel Coman, Xenophon Papademetris, Lawrence H. Staib, Fahmeed Hyder, Joseph B. Mandeville, P. Ellen Grant, Kiho Im, Hojoong Kwak, John F. Engelhardt, Christopher A. Walsh & Byoung-Il Bae in Nature. Published April 9 2018. Yale “One Gene Spurred Growth of Key Brain Area.” NeuroscienceNews. NeuroscienceNews, 15 April 2018. 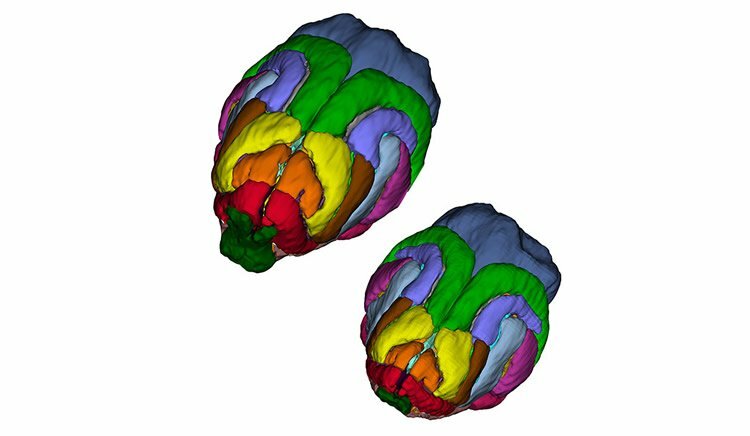 Yale “One Gene Spurred Growth of Key Brain Area.” http://neurosciencenews.com/genetics-cerebral-cortex-8797/ (accessed April 15, 2018). The human cerebral cortex is distinguished by its large size and abundant gyrification, or folding. However, the evolutionary mechanisms that drive cortical size and structure are unknown. Although genes that are essential for cortical developmental expansion have been identified from the genetics of human primary microcephaly (a disorder associated with reduced brain size and intellectual disability), studies of these genes in mice, which have a smooth cortex that is one thousand times smaller than the cortex of humans, have provided limited insight. Mutations in abnormal spindle-like microcephaly-associated (ASPM), the most common recessive microcephaly gene, reduce cortical volume by at least 50% in humans but have little effect on the brains of mice this probably reflects evolutionarily divergent functions of ASPM. Here we used genome editing to create a germline knockout of Aspm in the ferret (Mustela putorius furo), a species with a larger, gyrified cortex and greater neural progenitor cell diversity than mice, and closer protein sequence homology to the human ASPM protein. Aspm knockout ferrets exhibit severe microcephaly (25–40% decreases in brain weight), reflecting reduced cortical surface area without significant change in cortical thickness, as has been found in human patients, suggesting that loss of ‘cortical units’ has occurred. The cortex of fetal Aspm knockout ferrets displays a very large premature displacement of ventricular radial glial cells to the outer subventricular zone, where many resemble outer radial glia, a subtype of neural progenitor cells that are essentially absent in mice and have been implicated in cerebral cortical expansion in primates. These data suggest an evolutionary mechanism by which ASPM regulates cortical expansion by controlling the affinity of ventricular radial glial cells for the ventricular surface, thus modulating the ratio of ventricular radial glial cells, the most undifferentiated cell type, to outer radial glia, a more differentiated progenitor. It is good but. I work in applied microbial genetics.